Auburn(JM) As the 68th meeting between the Alabama Crimson Tide and the Auburn Tigers approaches, football fans across the state are joining together for a giant yawn and a long Saturday afternoon of doing something else for a change. "Normally this is a date you circle on the calendar at the beginning of the year," said Auburn alumnus Davy Pritchard, "but after the last couple of weeks I don't know if I could sit through a whole game. I'll probably rake the yard or get a head start on the Christmas decorations." Alabama fans seem to be, if anything, even more discouraged. "I wish Coach Shula all the best, and it would be great to beat the Tigers on their home field, but even then we'd only be 5-7 with no bowl eligibility," said longtime season-ticket holder and RV owner Rob Burleson, "Normally I'd say you could throw out the records, but in all honesty I don't see how you can ignore the fact that these two teams are playing terrible football." In any other year this would be the game that establishes bragging rights for the next 365 days. Regardless of the outcome neither team will have much to brag about this year. "So what if we blow them out?" asked Bama student Hines Crenshaw, "It's nothing Georgia Tech didn't do just a few weeks before taking a ridiculous beating from Duke... DUKE! in FOOTBALL, for Christ's sake!" Likewise, Tiger fans who once relished the chance to face the Tide at home have accepted that there's really nothing to gain by beating Bama and everything to lose. "I just hope Carnell stays healthy so he can play early in the NFL, said Tommy Blankenship, a lifelong Tiger fan and coach of 'Da Aubrun Tygorz' NFL fantasy football team. 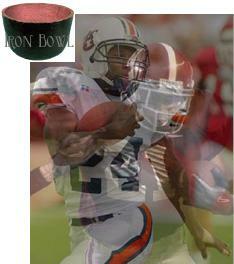 Rudi Johnson and Stephen Davis are the torchbearers for Auburn pride now. The Iron Bowl has lost it's luster. Anniston(KW) The city of Anniston was placed under marshal law over the weekend following a total breakdown of law and order. Unsubstantiated reports of power outages and widespread violence have surfaced as well as much more disturbing rumors that some type of rapidly spreading virus has infected the populace. One day before it mysteriously ceased publication, the Anniston Star reported that an undetected leak from the Anniston weapons incinerator had occurred. It appears that a pale green gas escaped the compound and made its way through downtown Anniston. The gas, an unspecified nerve agent, was developed by the army in an attempt to 'reanimate' soldiers that had been killed in battle. As a result, Anniston's dead have risen from their graves and now roam the city. Once reanimated, the living impaired or 'zombies' have an insatiable hunger for fresh brains. Any person bitten by a zombie is quickly transformed into one of these freakish creatures although some victims merely become Episcopalians. 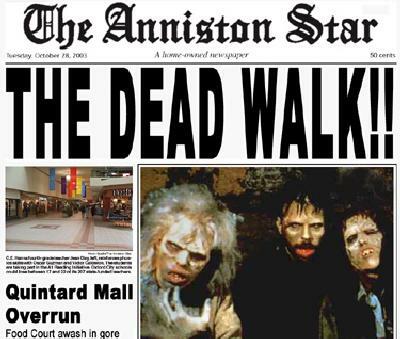 Since most people with any brains at all left Anniston months ago the outlying countryside has now become infested with zombies as well. Although the city is nearly deserted, a few survivors have barricaded themselves inside the Quintard Mall in a desperate attempt to withstand the horrific zombie onslaught. The incinerators early warning system was supposed to alert residents in the event of a chemical leakage or zombie attack but apparently failed to do so. For its part, the Army has withdrawn from the city and placed it under a military quarantine. Army spokesmen contend that no leak ever occurred and that the zombies are in fact covert Al-Qaeda operatives. Elected officials throughout the state are baffled and seem unable to deal with Annistons crisis. Attorney General Bill Pryor has advised all residents to remain calm and if necessary defend themselves with burglar alarms and handguns. Governor Riley has scoffed at the crisis claiming that it is merely an outbreak of pink eye. Don Siegelman has suggested that the passage of a statewide lottery could be used to combat the zombie proliferation. Any survivors are advised to tune in to Annistons emergency radio station KZMB which continues to broadcast warnings and SEC updates. Downtown(KW) Birmingham celebrated one of its most hallowed traditions last Friday with the annual presentation of the Birmingham News Carrier of the Year. 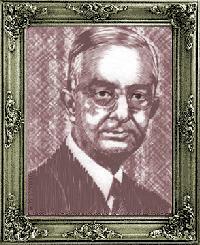 The annual award is given to the most promising Birmingham newsie with type O negative blood. Each years winner gets the chance to spend an evening with Victor Hanson II. The prize is considered a great honor since Hanson is known to be highly reclusive and has a strong aversion to crowds and sunlight. The newspaper mogul does not dine until midnight so the lucky winner is usually feted with heavy hors doeuvres while waiting for Hanson. The awardee is admonished to relax to help stimulate the blood flow. It is not unusual for more than one winner to be named per year depending on Mr. Hansons mood and appetite. This year, Vector Sang was named as the 2003 Carrier of the Year. Sang then made a brief speech in which he exclaimed, Lord no, Oh God, Jesus Christ! before being forcibly ushered into the building. One hour later, in a rare public appearance Hanson proclaimed that this years honoree had fantastic taste and that he was already looking forward to next years ceremony. The event traces its origins to 1892 when a young Carpathian immigrant named Vlad Tepes arrived in Birmingham. Prince Vlad had a passion for news and began his first newsletter The Blood is the Life in 1893. The newspaper did not fare well, however, and was forced to close it doors two years later. Undaunted, Vlad changed his name to Victor Hanson and founded a new paper, the Birmingham News. Through a series of happy accidents most of his competitors were soon found either eaten or drained of blood. As such, the Birmingham News went on to become the most beloved newspaper in the state dispensing news in exactly the same fashion for over a century. In order to celebrate his success Victor awarded the first Carrier of the Year to an ecstatic Jonathan Harker in 1895. The rest, as they say, is history. Gyro District(JM) Reports of a 'scary clown' terrorizing children at the old McDonald house continued this week, leading Children's Hospital officials to review their involvement with the southside institution. 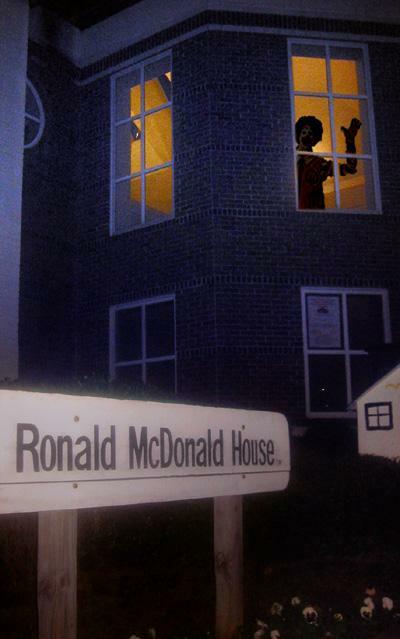 Ronald McDonald house resident manager Glenn Orly refused to comment on rumors of a lanky, laughing clown figure appearing with the young siblings of hospital patients that are staying temporarily at the facility with their families. Nevertheless, evidence that something unusual is affecting the residents can be found everywhere in the fevered red and yellow crayon drawings posted on doors, the ineradicable odor of hamburger grease that permeates the hallways, and the stray bright candy-apple red wads of hair pulled from the return-air filters by groundskeeper Willy MacDougal. "Aye, I thot it was me own 'air, but as ye can see, mine is more purple red, and this is orange red as if it were forged by lucifer himself! I mus' pull out a wad of this out of the ducts twice a week! And I 'ate every one! Ya heard me!!" Though obviously frightened by the mystery clown, the children seemed somewhat relieved to talk about their experiences with the ghastly smiling goblin. One little girl described the figure as 'a cold laughing giant' who apparently kept picking her up and laughing at her tearful wails, which were met only by soulless glee. Asked if the clownish man did anything else that made her uncomfortable, the girl looked to the floor and muttered, "he just kept laughing and laughing." Another child recounted how he dreaded the long afternoons while his parents worked in the communal kitchen and the the gaunt giant would slip into the room and dance circles around his wheelchair, taunting and spinning it before disappearing up the stairs. Amelia Thorvald, outreach director for the Children's Hospital would not elaborate on the decision before the hospitals board, but referred only to a statement released earlier by her office that briefly said that "Children's Hospital strives to improve the health and well-being of all children and will do its utmost to eliminate any source of fear or bad feelings."